The faculty is the backbone of any institution. The way the faculty members teach has a seminal influence on what the students learn. The role of the faculty and their competency in the transactional processes of educational curriculum remain crucial to an effective outcome of learning. 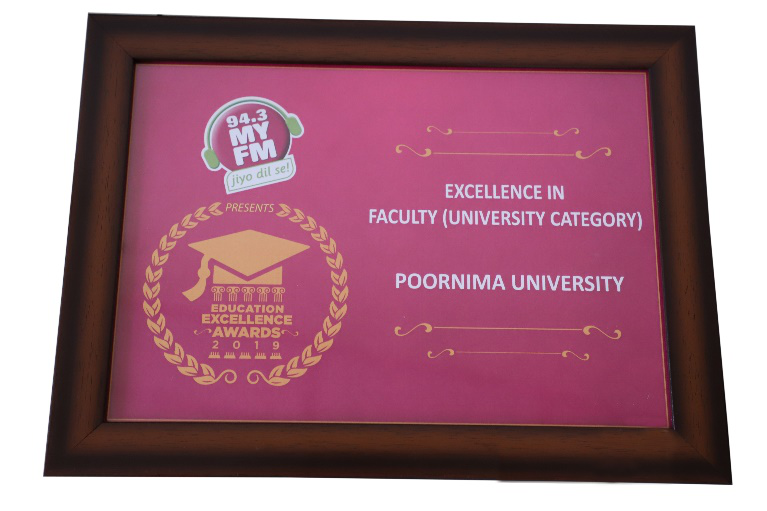 Recognizing the exemplary performances of our proud faculty members, Poornima University has been recognized and bestowed with Excellence in Faculty (University category) – 2019 by the popular 94.3 My FM. 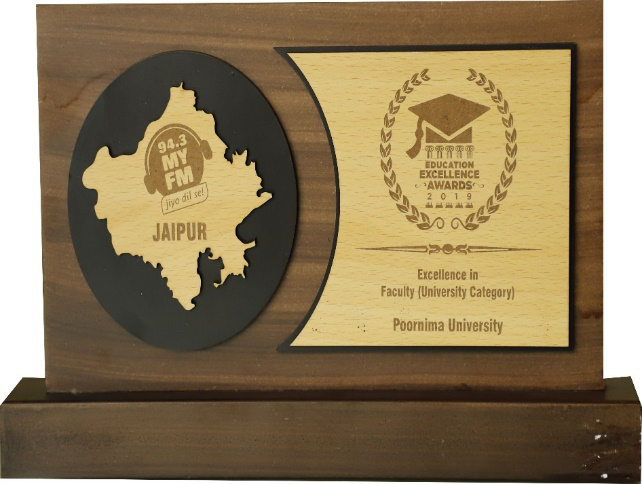 This award has been presented in recognition of composite excellence shown by the faculty members and their unconditional dedication towards building a strong education system within the realms of Poornima University. On behalf of the Faculty the award was received by Mr. MKM Shah, Director (Admin & Finance) and Mr. Rahul Singhi, Director. Awards are like a shining acknowledgment of the significant contribution our faculty tirelessly make towards making Poornima University a globally recognized one and for carving leaders of tomorrow in today’s youth. Outstanding teaching is the one that challenges, empowers and compels us to question the existing norms while delighting us to find the right answers. It also implies an instructional and institutional approach while making use of technological advancements. Our faculty members strive to contribute gloriously to the quality of life within the college and foster a positive environment facilitating interaction, development and promoting productivity. The teacher student relationship is beyond the boundaries of classroom walls, with students reaching out for help in both academics and personal growth, it is a relationship that is nurtured for its purity. Staff members also contribute to a college’s progress and success. They are the wheels responsible for implementation, innovation, and effectiveness. Teachers, awaken, equip and shape hungry minds with wisdom and knowledge. They provide guidance, act as pillars of strength, inspire and mentor students while writing the pages of their life. When their work is recognized and appreciated through such awards, it acts as an added bonus fueling them with more power and enthusiasm. It is the faculty members and the students that give life to this tangible campus. We, as a university, recognize the contributions of our faculty members to the pursuit of the university’s progressive agenda and strive for their betterment as they strive for ours. We shall aim to strive for excellence each year while maintaining the quality of education, learning, and life at Poornima.